The increasing world demand for protein has resulted in increasing commercial animal production, and inorganic phosphate supplements play an important role in the animal feed industry. Calcium phosphates, the most widely used phosphate supplements, supply essential minerals for the development of strong teeth and bones in livestock, poultry, and pets. Feed-grade calcium phosphates include dicalcium phosphate (DCP), monocalcium phosphate (MCP), and tricalcium phosphate (TCP). Phosphate chemicals are used commercially in fertilizers, animal feeds, and industrial products, and as additives in food. 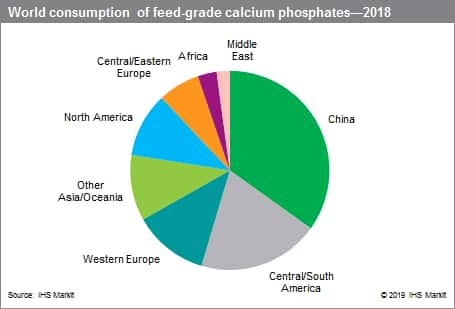 Overall, animal feed–grade phosphates are estimated to account for only 6% of total world phosphate consumption. The largest applications for phosphates are in agricultural fertilizers (83%), while industrial markets (including detergents and specialty applications) account for 11%. This report focuses on the use of phosphate chemicals as feed supplements for livestock, poultry, and pets. Overall, the feed phosphate industry currently has excessive capacity after a phase of rapid expansion thanks to low technical barriers. Lower prices and proﬁtability since 2015 have resulted in consolidation in the industry. On the other hand, the lower feed cost has helped support feed phosphate demand growth, especially in developing countries, where there are lower application rates. Feed phosphates are used mainly in the poultry and swine sectors, and to a much lower extent in cattle feed. Poultry production consumes more phosphorus than any other meat source. There has also been increased use of feed phosphate supplements in the pet food sector, albeit from a very small base. Among the three major feed phosphate products, DCP is the dominant product used today, accounting for nearly twothirds of the total market in 2018. However, MCP will drive demand growth and outperform the other product categories, thanks to better digestibility and lower cost to produce. MCP also results in faster-growing animals requiring less feed. MDCP, a blend of MCP and DCP, is also gaining popularity in the market. DCP consumption has been declining, particularly in Western Europe, as it is being replaced by MDCP. TCP, which is consumed mainly for poultry, is expected to show strong growth, especially in China.